Daheyat Al Areen which is spread across 245,000 square metres, and representing total investment of USD 600 million, is a project managed by Gulf Holding Company's (GHC). 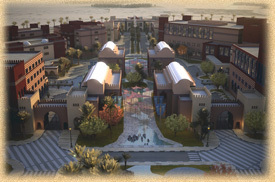 Daheyat Al Areen will boast of state-of-the-art commercial, residential and mixed use development areas. Being in line with GHC's Signature Series, each component of the project will have its individual stamp and distinguish itself through themed designs and unique features. Daheyat Al Areen, which is a unique component of the Al Areen development, is strategically located with good accessibility to both Manama city and the causeway linking the island to the Kingdom of Saudi Arabia. Daheyat Al Areen comprises five zones: The Boulevard South, Old Town, the Boardwalk, Park Lane and the Esplanade. These zones boast an impressive blend of residential products, including apartments, duplexes, townhomes & luxury villas, offices, high-end commercial, a souq, restaurants and cafes, a hotel, serviced apartments, a health club, recreational amenities, green parks and community spaces. 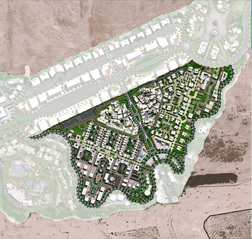 Moreover, they are diverse developments in the vicinity, providing additional amenities to Daheyat Residents, including the recently opened Lost Paradise of Dilmun water themed park to the North-West, the Al Areen Palace & Spa to the South, the Sarab project to the North, a polyclinic to the West as well as additional residential communities. The Formula 1 circuit and a wildlife reserve are also in close proximity to the Daheyat Al Areen project.